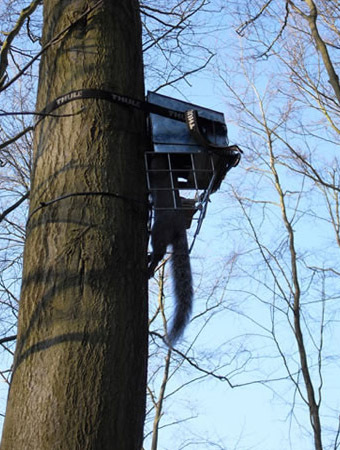 Grey squirrels cost the British economy an estimated £14 million per annum according to a study published by the international scientific organisation CABI for DEFRA, Scottish Government and the Welsh Assembly. The recently published report also estimated that the total cost to the British economy of invasive non native species was £1.8 billion every year. 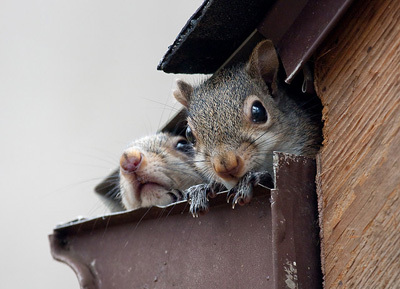 Grey squirrels are identified as having a wide range of impacts from reduction in wood production to an adverse effect on biodiversity. But more and more damage is occurring in and around our towns and cities. What other damage are they causing? Chew holes in sofits and build dreys in lofts. Tear up insulation and gnaw roof struts and rafters. Chew Timber, wires and stored goods. Eat fruits, nuts, seeds, flower buds and vegetables. Dig up and eat bulbs and corms. Raid bird feeders and take eggs from birds’ nests. Damage lawns by burying or digging up winter food stores. Strip bark off trees, especially sycamore, maples, ash and beech. Gnaw on plastic, such as hosepipe's and plastic netting.